After you've collected a number of contacts in Mailchimp, you may want to export those contacts into a CSV file. You can export an entire audience, a segment, or a group. Exports can include subscribed, non-subscribed, unsubscribed, and cleaned contacts. In this article, you'll learn how to view and export your contacts, and access the export history for each audience. The General Data Protection Regulation (GDPR) is a European Union (EU) privacy law that gives EU citizens the right to ask about how their personal data is stored and used. If a contact requests their personal data from you, you’ll need to export directly from their contact profile instead of using the processes described in this article. Contact exports don't include campaign report data, like open and click rates. To download campaign report data, export a campaign report. Your export includes a ZIP file that contains separate CSV files for each type of contact (subscribed, unsubscribed, non-subscribed, and cleaned). Unarchive the ZIP file to access CSV files and open them in your preferred spreadsheet application. Contact export history and their CSVs are available in your account for 30 days. The contact table provides basic information about the contacts in your audience. Reorder columns or turn them on or off to configure your preferred view. When you hide a column, it doesn't delete the corresponding audience field or hide the field on your signup form. To configure the columns on the contact table, follow these steps. Uncheck the boxes next to the fields you want to hide or check the boxes next to the fields you want to view. 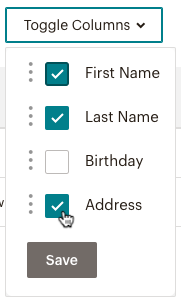 To reorder columns, click and drag the three dots next to any name field and drag it to your preferred location. To view or export your entire audience, follow these steps. After the export loads, click Export as CSV to download the file to your computer. To view or export a saved segment, follow these steps. Click View Segment, and choose the segment you want to export. To view or export tagged contacts, follow these steps. 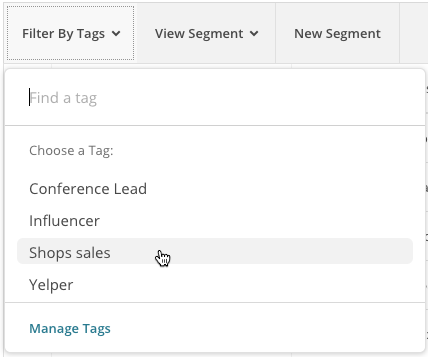 Click the Filter by Tags drop-down menu and choose the tag you want to work with. We'll generate a segment of all the contacts in your audience with that tag applied to them. From the segment view, click the Filtered By Tags drop-down menu to choose more tags. When you're done, click Export Segment. You also have the option to view a group, or export it. To view or export a group of subscribers, follow these steps. Click View Groups to expand the group you want to view. Click the # contacts link to view the individual contacts in each group. How you open your export file depends on the spreadsheet program you use. You can open the file with any spreadsheet program, but we find most people use Microsoft Excel, Google Sheets, or OpenOffice Calc. Here are some links to show you how to open files in these programs. Your exported CSV file displays your audience fields, along with contact data that Mailchimp collects. 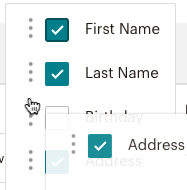 If you have GDPR-friendly forms enabled for your audience, the CSV file header will match the GDPR form field label in your segments. If your audience is GDPR-enabled, this column will show each marketing permission a contact has opted into in the signup form. The contact's relationship to your email marketing campaigns. The contact's member activity rating. The time a contact accessed your signup form, if they used it to sign up. This will not show for contacts who haven’t completed the double opt-in process. The IP address used when the contact accessed the hosted signup form. This will not show for contacts who haven’t completed the double opt-in process. The date and time the contact clicked the link in the opt-in confirmation email. The IP address used when the contact joined your audience. Our system is based off UTC time. GMTOFF indicates the adjustment made to the time based on geolocation data, and DSTOFF takes daylight savings time into account. These are used in conjunction to determine TIMEZONE. Based on the contact’s geolocation data. This will only show data when geolocation information has been captured. The date and time when information in the contact's profile was last changed or updated. LEID is the unique identifier for a contact, specific to an audience. EUID is the unique identifier for a contact on the account level, across all audiences. Notes added within the contact profile page. Here are some examples of data that is not included in your audience export. For GDPR compliance purposes, some of this data can be [exported from an individual contact’s profile]. To view or download an export from the past 30 days, follow these steps. Click the Manage contacts drop-down and choose Contact exports. Each entry on the Exports page shows the date contacts were exported, who made the export, and how many contacts were exported on that date. Click Export as CSV to download a copy of any previous export. My export includes strange or unexpected characters. If your data contains special characters, your export may not display correctly in Excel. To see special characters in Excel, use one of these workarounds. My address field just says "US." When physical addresses are imported incorrectly, our import tool inserts “US” as the default value. You’ll need to reformat and re-import your original file in order for Mailchimp to read, store, and export the address data correctly. To learn more about how to properly format physical address data in Mailchimp, check out our format guidelines. After your file is corrected, perform an auto-update import to fix the address fields.